Not only does a piece of land stretching over 70,000 acres preserve beautiful landscape and wildlife, it also honors a president who is credited with doing more for the National Park System than any other. 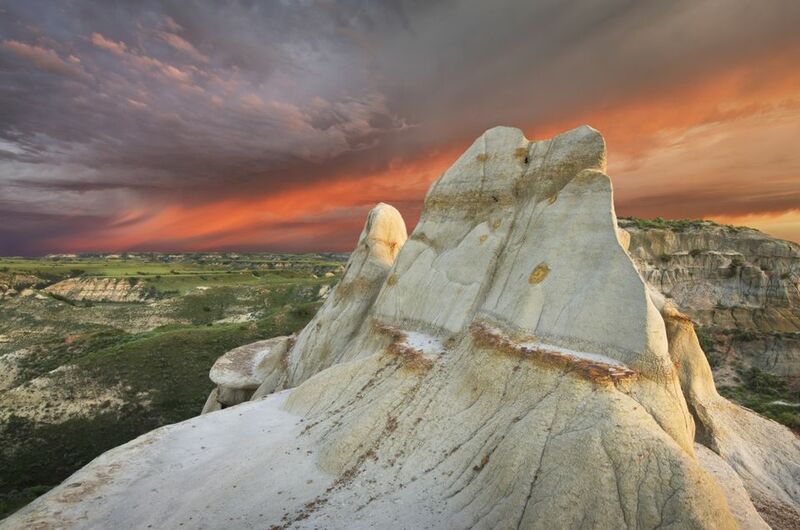 Theodore Roosevelt first visited North Dakota in 1883 and fell in love with the natural beauty of the rugged badlands. Roosevelt would continue to visit the area and later go on to establish 5 national parks and assist in the foundation of the U.S. Forest Service. Roosevelt's experiences in the area not only directed him to serve as president, but to become one of the world's leading land conservationists. In 1883, Theodore Roosevelt traveled to North Dakota and fell in love with the area. After speaking with local ranchers, he decided to invest in a local cattle operation known as the Maltese Cross. He would return to the ranch in 1884 to seek solitude after the death of his wife and mother. In time, Roosevelt returned east and back into politics, but was very public about how the badlands affected him and just how important preservation should be in America. The area was designated the Roosevelt Recreation Demonstration Area in 1935 and became the Theodore Roosevelt National Wildlife Refuge in 1946. It was established as the Theodore Roosevelt National Memorial Park on April 25, 1947 and finally became a national park on November 10, 1978. It is comprised of 70,447 acres, of which 29,920 acres are preserved as Theodore Roosevelt Wilderness. The park is comprised of three geographically separated areas of badlands in western North Dakota and visitors may tour three sections: the North Unit, the South Unit, and the Elkhorn Ranch. The park is open year-round but note that some roads may close in the winter months. Services are limited from October to May so the best time to plan a visit in during summer. If you want to avoid the crowds, visit during late spring or early autumn when the wildflowers are in bloom. South Unit: This unit is located in Medora, ND so take I-94 exits 24 and 27. Medora is 133 miles west of Bismarck, ND and 27 miles east of the Montana state line. Note, the Painted Canyon Visitor Center is 7 miles east of Medora on I-94 at Exit 32. North Unit: This entrance is along U.S. Highway 85, located 16 miles south of Watford City, ND and 50 miles north of Belfield, ND. Take I-94 to U.S. Highway 85 at exit 42 in Belfield, ND. Elkhorn Ranch Unit: Located 35 miles north of Medora, this unit is accessible via gravel roads. Travelers must wade through the Little Missouri River so ask a ranger at one of the visitor centers for information on best routes. Visitors traveling into the park via automobile or motorcycle will be charged $10 for a 7-day pass. Those entering the park by foot, bicycle or horse will be charged $5 for a 7-day pass. Reoccurring visitors may want to purchase the Theodore Roosevelt National Park Annual Pass for $20 (valid for one year). Those holding an America the Beautiful - National Parks and Federal Recreational Lands Pass will not be charged any entrance fee. Pets are allowed inside Theodore Roosevelt National Park but must be restrained at all times. Pets are not permitted in park buildings, on trails, or in the backcountry. Horseback riders are allowed but are prohibited in the Cottonwood and Juniper campgrounds, picnic areas, and on self-guided nature trails. If you bring forge for the horse, it must be certified weed-free. Besides the visitor centers, the park has some great places and trails to visit and explore. Depending on how long your stay is, you may want to stop at a few or all! Scenic drives: If you only have one day, be sure to take either the Scenic Loop Drive in the South Unit or the Scenic Drive in the North unit. Both offer incredible views and spots to stop for nature walks and longer hikes. Maltese Cross Cabin: Visit the rustic headquarters of Roosevelt's first ranch. The ranch is full of period furnishings, ranching equipment, and even a few of Roosevelt's personal belongings. Peaceful Valley Ranch: Historic buildings were used in many ways from a park headquarters to working cattle. Today, visitors can take a horse ride from May to September. Ridgeline Nature Trail: Though it's only a 0.6-mile long trail, it does require some strenuous climbing. This is a great spot to view how wind, fire, water, and vegetation have combined to create a unique environment. Coal Vein Trail: Enjoy this 1-mile hike to view a lignite bed that burned from 1951-1977. Jones Creek Trail: The trail follows an eroded creek bed for 3.5 miles offering visitors an excellent opportunity to see wildlife. But be aware there are prairie rattlesnakes in the area. Little Mo Nature Trail: An easy trail equipped with a pamphlet lets visitors identify native plants that Plains Indians used for medicine. Wind Canyon Trail: A short trail that overlooks a beautiful vista and reminds visitors just how important of a role wind played in shaping the landscape. Wind Canyon also offers opportunities for longer hikes. Two campgrounds are located within the park, both with a 15-day limit. Cottonwood and Juniper campgrounds are open year-round on a first-come, first-served basis. Campers will be charged $10 per night for a tent or RV site. Backcountry camping is also permitted but visitors must obtain a permit from one of the visitor centers. Lake Ilo National Wildlife Refuge: Located about 50 miles from Theodore Roosevelt National Park, visitors can find protected waterfowl and more recreational activities than most refuges. Activities include fishing, boating, nature trails, scenic drives, and archeological exhibits. The refuge is open year-round and may be reached at 701-548-8110. Maah Daah Hey Trail: This 93-mile rugged, nationally-acclaimed trail is open for non-motorized recreational use, such as backpacking, horseback riding, and mountain biking. Managed by the U.S. Forest Service, this is a great day trip for anyone in the area. Maps are available online. Lostwood National Wildlife Refuge: In one stretch of prairie, visitors can find ducks, hawks, grouse, sparrows, and other marsh birds. It is a popular destination for bird-watchers from all across the country. Other activities include hiking, hunting, and scenic drives. The refuge is open from May through September and may be reached at 701-848-2722.